It's huge, it's the only one in America, and best of all it fits in a two car garage. Meet the massive TAM-110. 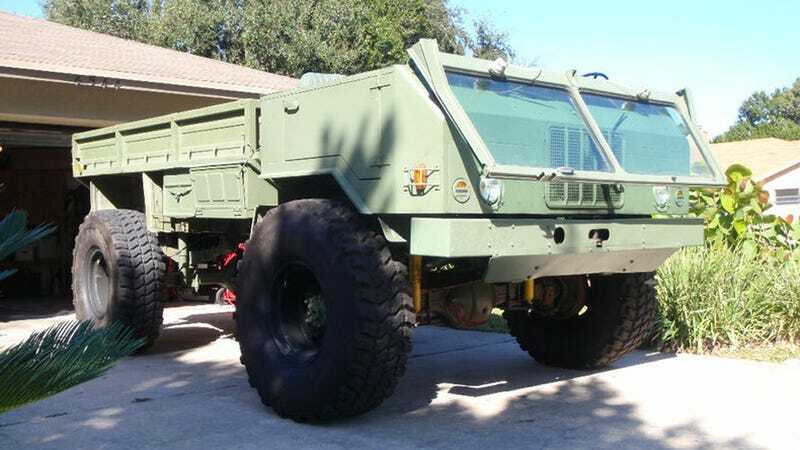 Currently listed on Ebay, this rare monster sets a new standard of drool-worthiness and obscurity in the already awesome world of Armageddon-proof ex-military trucks. Although this super cool TAM-110 looks like nothing but fun on road and off these days, it was originally constructed with a more serious purpose than cruising the beach and impressing the neighbors. The TAM-110 was developed in the 1980s by Tovarna Avtomobilov Maribor for the former Yugoslavian army. As the Ebay listing points out, the truck remains the standard vehicle of Yugoslavia and its successor countries. Accordingly it is still fairly hard to acquire a TAM-110, even in its native part of the world. No one really "needs" a gigantic and impossible to find former military truck, but that is no reason not to want one—badly. Someone wanted this TAM-110 badly enough they went through the no doubt nightmarish process of importing the truck from Serbia to America. According to the current owner this TAM-110 was purchased from a Serbian border patrol station and brought over to the US several years ago. Somehow this massive vehicle is registered and street legal. The 110 horsepower 5.8 liter air cooled diesel can push the TAM-110 to 55 MPH even with the huge 47 inch tires and custom wheels attached to the trucks 2.5 ton axles (rating, not actual weight). Sure American issue deuce-and-half surplus trucks are cool, but this is an obscure and awesome vehicle that can fit into a normal garage with the windshield folded down. We want it badly. It appears from the Ebay auction we aren't the only ones fond of this TAM-110, bidding has reached over $21,000 with about two days left to go. Considering the fact this is the only chance to own one of these rare trucks without going through the hassle of finding and importing one yourself (until this one goes up for sale again), we wouldn't be the least bit surprised if the truck hits the reserve, likely somewhere near the $30,000 buy-it -now listed on the auction. Hat tip to Wowbagger the Infinitely Prolonged!